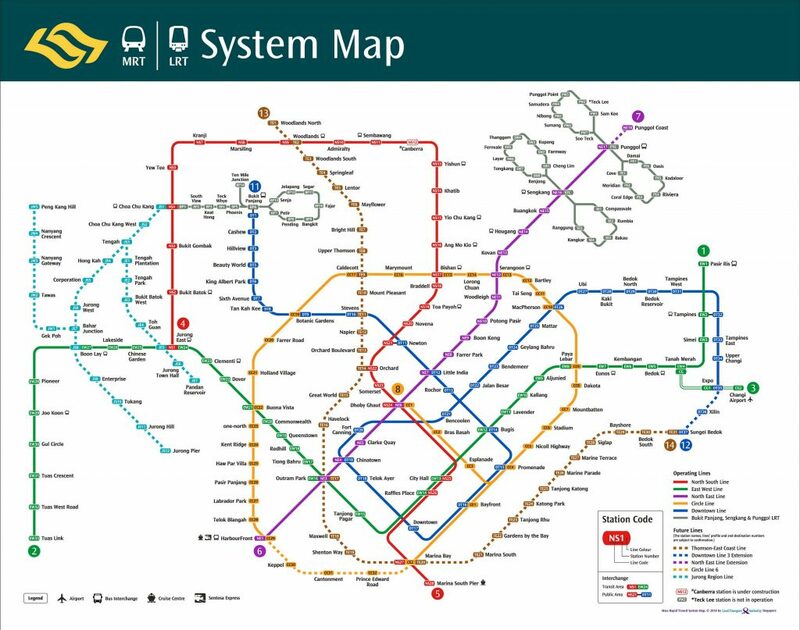 Singapore MRT Network Map as of September 2018. The urban rail network in Singapore comprises five metro lines and three light rail lines, referred to as the Mass Rapid Transit (MRT) and Light Rail Transit (LRT) respectively. MRT lines are colour-coded and LRT lines are indicated in grey. These rapid transit lines are operated by two private companies, SMRT Corporation and SBS Transit, under a contractual basis. In addition, there are other people mover systems at Changi Airport and Sentosa Island that do not fall under the rail network. In addition, rail services to Malaysia is presently offered via KTM West Coast Main Line, which will be replaced by a future RTS link. In addition, a High Speed Rail line to Kuala Lumpur is also being constructed. The Mass Rapid Transit (MRT) is the metro system of Singapore, providing daily passenger rail service across the island with an extensive network of train lines. 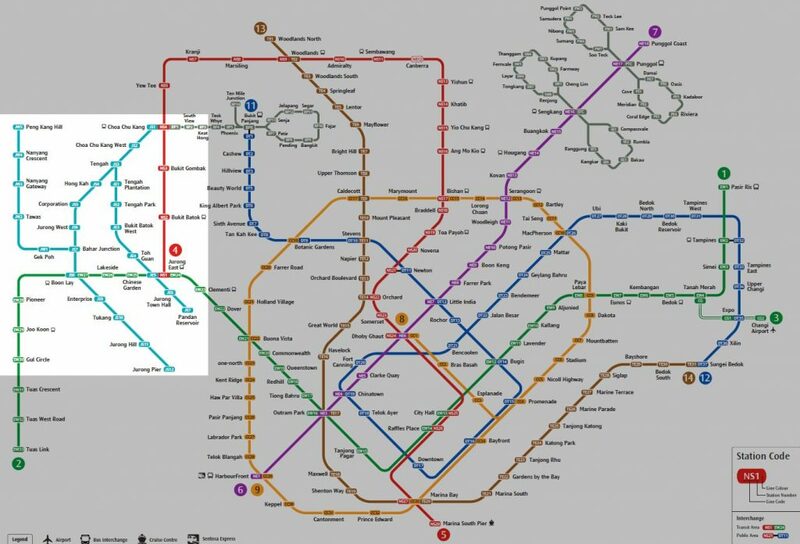 Currently, there are 5 MRT lines in Singapore covering over 152.9 km of route together with 113 stations in service, with more MRT lines and extensions under planning and construction by the Land Transport Authority. Train services are provided by public transport operators (PTOs) SBS Transit and SMRT Trains. They usually operate between 5:30am to 12:30am the next day, with extended operating hours during eves of Public Holidays that are usually accompanied by extended bus operating hours. The Light Rail Transit (LRT) is the ‘feeder service’ for the Mass Rapid Transit (MRT), providing rail connections for residents living in residential estates to the nearest MRT station, as well as for short-haul commute within a housing estate. There are 3 LRT lines in Singapore covering over 28.8 km of route, serving 43 stations in 4 residential estates. Currently, the Land Transport Authority has no public plans to build new LRT lines or extend current LRT lines. LRT services are offered by public transport operators (PTOs) SBS Transit and SMRT Light Rail. They usually operate between 5:00am to 1:00am the next day, with occasional extended operating hours during eves of Public Holidays. The national aviation authority Civil Aviation Authority of Singapore also operates a LRT network within Changi International Airport, known as the Skytrain. 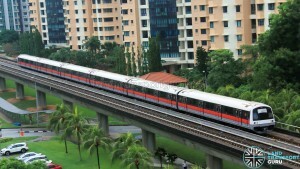 Other rail lines in Singapore are privately-owned and operated, and as such, are not required to meet the regulatory standards imposed on rapid transit lines. Currently, Changi Airport Group operates the Changi Airport Skytrain, an automated people mover (APM) network shuttling between airport terminals. In addition, the Sentosa Express Monorail operated by the Sentosa Development Corporation offers transit within Sentosa island and to the mainland. Many types of rolling stock are operated across the Singapore rail network, ranging from high-capacity and medium-capacity trains on MRT lines, to lower-capacity trains on LRT lines. All passenger trains are of the electric multiple unit (EMU) type, drawing power from electrified rails or overhead lines.